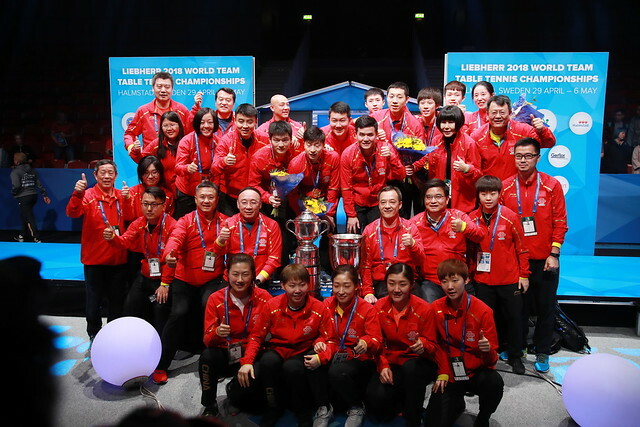 Another amazing day in Halmstad packed with shock outcomes, day two of the Liebherr 2018 World Team Table Tennis Championships produced plenty of twists and turns for table tennis fans to enjoy across the two Championship Divisions with Team England stealing the spotlight on Monday 30th April. The surprise package of the 2016 World Team Championships, England looks to be at it again following a sensational day two outing at the Halmstad Arena. Claiming a major 3-1 win over Chinese Taipei earlier in the day, but England’s standout result came in the evening session against second seeds Japan. Liam Pitchford was the star of the show with stunning victories over Tomokazu Harimoto (11-5, 11-5, 11-3) and Jun Mizutani (11-4, 9-11, 11-9, 6-11, 11-8). England’s third success came courtesy of Sam Walker, who saw off Koki Niwa in straight games (11-9, 12-10, 11-8). There were big upsets in Groups A and B with Sweden and Brazil both earning noteworthy results: with the backing of the home crowd, Sweden dealt a 3-2 defeat upon Hong Kong while Eric Jouti’s amazing effort against Tiago Apolonia (8-11, 11-5, 11-6, 5-11, 11-9) saw Brazil stun Portugal. France suffered its first defeat of Group D with rivals Austria claiming an important 3-0 victory over the fourth seeded team. Following a difficult first day at the office Team USA has finally got its Group B campaign up-and-running with a comfortable win over Egypt. Entering the tie as the lower seeded team but a terrific display from Wu Yue in the opening contest against Dina Meshref (13-11, 11-7, 11-8) helped inspire USA to a 3-0 success. Bronze medallists at the 2016 World Team Championships, DPR Korea and Chinese Taipei continue to lead by example in Group C with both sides picking up positive results on day two. Yet to suffer defeat in Halmstad, DPR Korea was relatively untroubled against the Czech Republic with Cha Hyo Sim, Kim Song I and Kim Nam Hae powering to a 3-0 victory while Chinese Taipei accounted for the Netherlands. Defeat earlier in the month at the 2018 Commonwealth Games, Singapore avoided another upset at the hands of India with Yu Mengyu getting the better of Manika Batra on this occasion (12-10, 8-11, 8-11, 11-5, 11-8). Over in Group D Hong Kong extended its winning run with a 3-1 triumph over Germany while Luxembourg claimed its first win of the group against Brazil thanks to a brace from Ni Xialian.